Busy week in the Basketball capital of the United States but it's "live" music that should pique our interest. The Side Door Jazz Club in Old Lyme welcomes pianist Benny Green and his Trio on Friday (4/18). Green, born in New York City but raised in Berkeley, CA, has been studying and playing since he was 7 years old. His father, a jazz saxophonist, had a large record collection and young Benny took it upon himself to figure out what was going on in the songs of Thelonious Monk and Charlie Parker. Over the course of his career, he was worked and recorded with Betty Carter, Oscar Peterson, Ray Brown, Art Blakey & The Jazz Messengers and so many others. He has recorded 15 CDs as a leader, the leanest being 2013's Sunnyside release, "Magic Beans." For his debut at The Side Door, Benny Green bring his fine rhythm section of David Wong (bass) and Rodney Green (drums). Doors open at 7:30 p.m. and the first set commences at 8:30. Call 860-434-0886 for more information. Firehouse 12 in New Haven continues its Spring 2014 Concerts Series on Friday with a return visit from Loren Stillman & Bad Touch (the quartet first appeared in the Elm City in October of 2008.) Saxophonist/composer Stillman, a native of London, England, has been part of the creative music scene since the mid-1990s, working with artists such as John Abercrombie, pianist Andy Milne, vibraphonist Chris Dingman, and the Vanguard Jazz Orchestra. Bad Touch features the same lineup as on the earlier gig and that is Nate Radley (guitar), Ted Poor (drums) and Gary Versace (Hammond organ) - they have a brand new CD titled "Going Public" (Fresh Sounds New Talent) and it's a fine musical experience, ripe with melodies and creative interactions. For tickets, go to firehouse12.com or call 203-785-0468. To learn more about Loren Stillman & Bad Touch, go to lorenstillman.com. The Buttonwood Tree, 605 Main Street in Middletown, welcomes pianist/vocalist Warren Byrd this Friday evening at 8 p.m. Byrd, a Hartford native who has been active on the CT and world scenes for several decades, is, perhaps, best known for his co-leadership and work with The Afro-Semitic Experience. His Middletown appearance is a solo gig in which one will have the opportunity to revel in his gospel-tinged soulful piano work plus hear some of the new poetry Byrd has been working on. He's got an imposing stage presence, a great touch and good sense of humor. For more information, go to www.facebook.com/events/715983908463600/ - for reservations, go to www.buttonwood.org. Back to The Side Door on Saturday for an appearance by the Marcus Strickland Quartet. The fine foursome - Strickland (saxophones), his twin brother E.J. (drums), David Bryant (piano) and Ben Williams (bass) - has been an ensemble for more than 5 years and it shows in their smart interaction, in how they not only push each other but also in how they listen to what the other is playing. The music they create encompasses myriad genres, is quite exciting and can also be emotionally satisfying. As usual, the doors open at 7:30 p.m. with the music starting at 8:30. For more information, go to thesidedoorjazz.com. 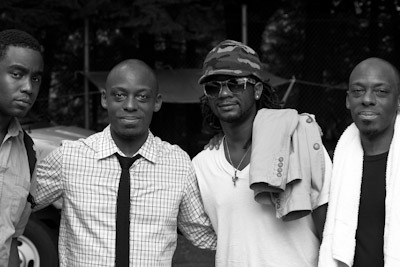 To learn more about Marcus Strickland, his band and their music, go to marcusstrickland.com.